You coach because you love the children that you teach. Each child has a unique personality that you love, but unfortunately that can cause a bit of chaos and bullying. If you are noticing bullying, here are 5 methods of dealing with bullying as a coach. People act out because of a problem that they have with themselves or their environments. They bully others to make themselves feel better. The first method of dealing with a bully is to talk to them about the negative behavior that you are noticing. Tell them you see what they are doing, you know how the team player that is bullied is feeling, and you understand that something may be going on that you do not know about. Bringing this to attention may help to deter some or all of the bullying, especially if the bully didn’t think you knew about the behavior prior to your chat. You do not have to talk to individuals specifically if you do not feel that the situation will improve. You can make a blanket statement at the start of the season, before practices, or before games that will let your team know that you are actively watching for negative behavior. State that any bullying that you notice will result in getting “benched” for the rest of the game. The bullies that are motivated most by playing in practices and in games will certainly think twice about instigating because the consequences just are not worth it to them. This will not work for every member on your team, but it is definitely a method of addressing potential problems before they arise. As a coach, and likely also a parent, you know how important it is to keep an open line of communication with your team players as well as with their parents. The parents live with these players and may offer you solutions to deal with behavior that is tailored to their particular player. Keeping an open line of communication with parents will keep parents involved. If you can get parents to attend games and practices than you know you will have an extra set of eyes zeroed in on any acts of negative behavior. If you can get parents on your side then the parents will feel empowered and included and will continue punishment if need-be when the student returns home. Truly, the line of communication that you keep with parents will prove to be one of your greatest assets in deterring bullying on your team. It is extremely important that you are acting as the type of role model you want your students to emulate if you want to deter bullying. You may do this by finding a reason to complement each and every single member of the team at least once in a practice or game if they are present. You can encourage members that aren’t playing well or are having a bad day to get back up and just keep trying to maintain a positive attitude. 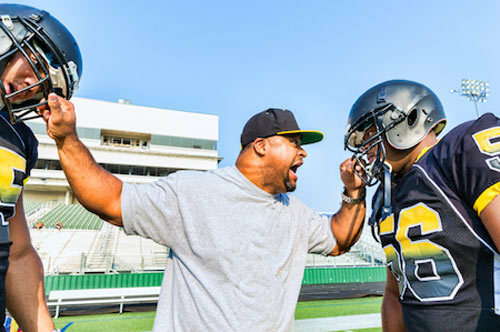 It can be easy to get into a routine of becoming the tough coach that yells commands just like a few of the coaches you may have had on sports teams growing up. If you turn into one of these coaches that exhibits bullying behavior, then it will be extremely hard for you to combat the bullying that your team members may be learning or validating because of your behavior. As a coach, you want to see your team have fun winning as many games as possible. You may accidentally find that you tend to put the same players in the same positions for significant portions or the entirety of a game to increase your odds of winning the game. Be careful that you are not doing this, especially if it means that one or more of your team members sits on the bench and feels left out. Maintaining a method of switching players between positions and including everyone in every practice and game equally will help keep everyone too busy to bully. It isn’t always easy to coach a team full of children that you love and then have to deal with bullying issues. The important thing to remember is that each child is special and can be praised for what they actually are doing well. Positive reinforcement will go a longer way than negative punishment. With the 5 methods of dealing with bullying listed above, you should be well equipped for dealing with any bullying that you notice.